Distribution: this subspecies occurs in North Africa, the Middle East and the Arabian Peninsula. It is found in SPNL IBA site (Aanjar/Kfar Zabad wetlands). It inhabits rocky mountainous areas, semi-arid regions and forests. It is included in the IUCN red list of threatened species, but with least concern. 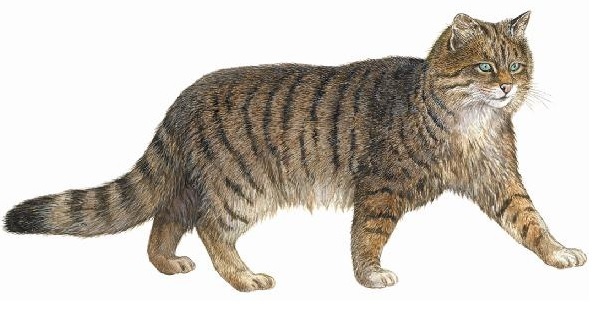 Description: the wild cat is larger than the domestic cat with a combined head and body; length of 54.5 cm, tail about 31.5 cm, skull about 9.2 cm long and weight about 7 kgs. It has short fur except on the pads of its paws, as is the case with other cat species. Its coat is generally light yellow, the fur on its back ranging from light to olive brown with white on the belly. The color of its ear tips and face resembles the color of rust but can also be either grey or dark brown. Its fur is smooth and dense, smoothest of all on the abdomen. The upper parts of its legs are brown. The wild cat has large eyes, broad cheeks and hairless lips. Its ears are long, triangular and upward pointing. Behaviour: The wild cat is strictly nocturnal. When faced with danger, it hides in holes and in trees which it climbs with great skill and at remarkable speed. It can run at speeds of up to 30 km/ph and can maintain this pace for some time. Diet: the wild cat feeds on reptiles including snakes, insects and rodents, especially rats and mice. 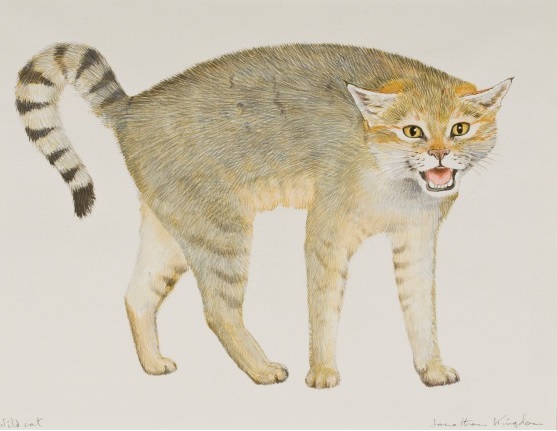 Our ancestors domesticated the wild cat and used it to protect them from unwanted rodents and reptiles in their homes.